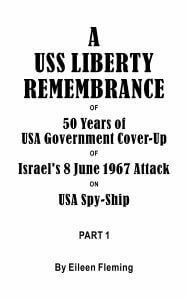 The USS Liberty had been America’s premier surveillance [spy] ship during The Six Day War. Israel had planned to invade Syria on 8 June 1967, but the USS LIBERTY got in the way and killed 34 Americans. Not a whimper was heard from the White House and Israel captured the Golan Heights the very next day. USS LIBERTY veteran Philip Tourney wrote. 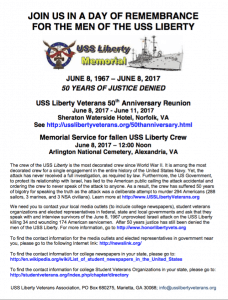 June 8 is USS LIBERTY Remembrance Day! Phil Restino was not in the Navy but is “simply a supporter of the USS Liberty survivors and their loved ones” since he first learned of the USS Liberty story in 2006. I knew I would do more than just listen to him and this year I will see Phil Tourney again at the USS LIBERTY Veterans 50th reunion which begins at Arlington Cemetery on June 8 and continues in Norfolk, Virginia. 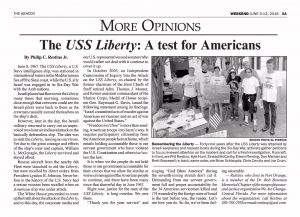 Phil Restino will remain in Florida spearheading another USS LIBERTY Remembrance Day event. My personal experience in the U.S. Military was a 2-year enlistment in the Army during “peacetime”, serving in the Infantry from 1983 to 1985. I helped start the Central Florida chapter of Veterans For Peace with the hope that veterans who had been in the wars (Vietnam and others) would join it and not let happen to this generation of U.S. troops what happened to them as far as being used for illegal wars based on lies. 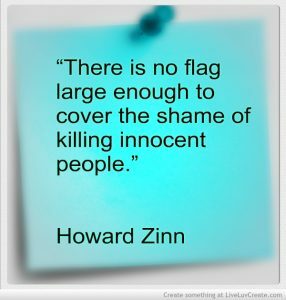 I’m not a war veteran, and with each year that passes I feel more and more uncomfortable with identifying myself as a “veteran”. 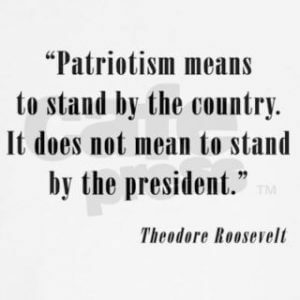 I’d prefer to be viewed simply as a supporter of the cause of justice for the men of the USS Liberty and an American who will speak out against the U.S. government sending U.S. troops to kill and be killed in illegal, unconstitutional wars of aggression based on lies regardless of who the President is! -Eileen Fleming will be reporting next from Arlington Cemetery on June 8 at the graveside memorial service for the USS LIBERTY crew. THIS POST HAS BEEN READ 38768 TIMES SO FAR. THANK YOU!